Ratchet clamps are perfect to secure Braided Vinyl tubing to barbed fittings. If you are using silicone or traditional thin wall tubing we highly suggest measuring the outside diameter of the tubing you will be working with to select the correct ratchet clamp. 1 1/4" Ratchet Clamp 1.62"
1 1/2" Ratchet Clamp 1.96"
These are great in theory; however, they are not even close to being properly sized. I ordered 4 to clamp my tubing on my return pump and to my return bulkhead. I have 3/4" inside diameter tubing so i ordered the 3/4" clamp because of the reviews saying to order smaller. The clamps arrived and don't even come close to fitting on the tightest setting. I have one clamped down on my 1" ID tubing and it barely holds it. The build quality seems good as far as being well made; however, they are useless if they don't fit anything. If they were able to clip one or two teeth more it would be perfect, I have tried the 3/4" on 6 different connections and only one of the fittings is large enough for the clamp. This is on my return pump which has a different, larger barb fitting. Have to change all of my barbs if I want these to work. some fit correctly other sizes don't , very bad customer support. I debated over how many stars to give these, but in the end it could only be one, as neither of the sizes I bought fit the tubing I have. I got 1/2 and 3/4 inch clamps and neither one will fully tighten around the 1/2 or 3/4 tubing I'm trying to clamp. I guess its time for plan b. Most of my tubing is 3/4" ID. I ordered both the 1/2" and 3/4" clamps. Unfortunately the 1/2" is too small and the 3/4" is too big. They would definitely work on 1" ID tubing. Odd that none of these clamps work for such a commonly used tubing. These clamps are tricky to get the right size. Luckily they are not expensive, and they work great! I have these on all the connections to pumps and bulkheads that are connected to vinyl tubing. Very easy on and come off with a little work but very nice and zero leaks. I've been using these clamps on my 150 gallon fowlr with 40 gallon sump system for well over a year. I ratcheted the clamps down gently using channel locks and they work perfectly with no leaks from my soft tubing sections in the tank plumbing. I'd definitely use these again for any other soft tuning applications I may need in the future. Had used hose clamps for original setup three of eight failed do to rust the hose stayed in place without them but for peace of mind purchased the Ratchet clamps. The 1 1/4" closed tight around the braded vinyl tube and didn't bottom out the 3/4" bottomed out and could still be twisted around the tubing I don't think it will be a problem but wished it was tighter. I bought this for my Aqueon sump setup. This 1" clamp did not fit my 1" plumbing. The hose I used was plastic and not vinyl. This may work for vinyl tubing but as stated in other reviews this will not work for all 1" standard plumbing. I will try to buy another size and update my review. These plastic clamps are ok if used out of saltwater and not off a pump. I would also recommend doubling up if you're placing them on a pump. The thing is that after a random amount of time in saltwater they just get brittle and snap. They work better for something like a UV Sterilizer connection that's out of the water, for example. But any clamp that's on a submerged pump I use Titan Titanium clamps. They're more expensive, but don't rust while submerged in saltwater like the "stainless steel" clamps do. I also double up on the Titans as well if they're on a pump because I had a hose pop off a pump once (with plastic clamps) and just shot water everywhere, flooding the basement room. So under water use metal and it has to be Titanium if you don't want rust. I only gave four stars as it seems that these could be a bit wider to cover more area on the hose for compression. They do work though and are very easy to use. For the sizes listed, is the measurement for the inner or outer diameter? 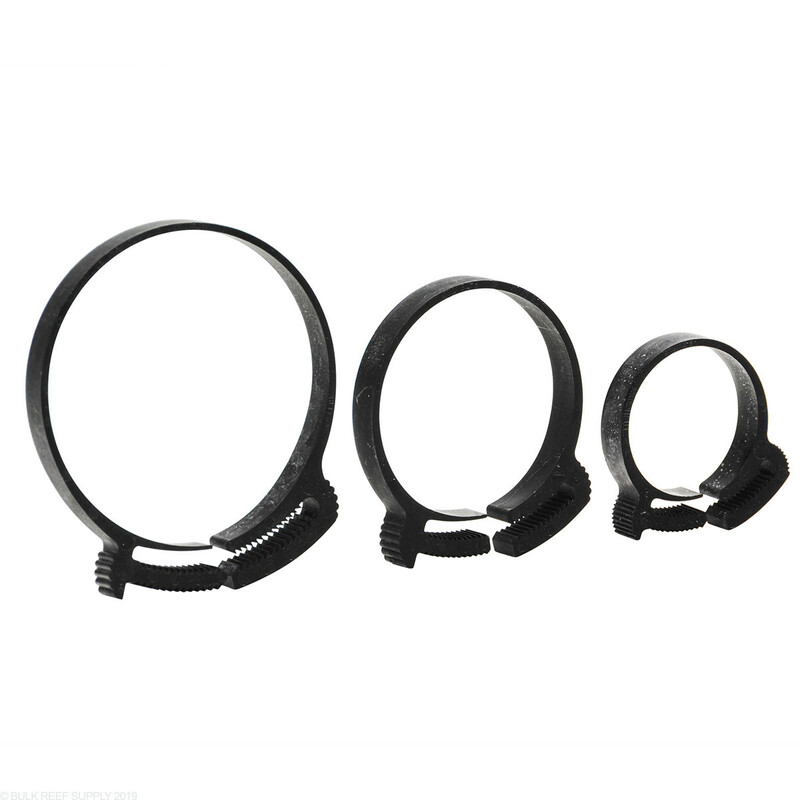 For example, if you have tubing with a 3/4" inner diameter and a 1" outer diameter, which size should you order? Thanks. The ratchet clamps (and all of our plumbing) are all rated in nominal sizes. This doesn't refer specifically to either the ID or the OD but the plumbings nominal size. Nominal size is the standardized sizing in plumbing (just like if you went to home depot, etc) so that you know a 1" pipe will fit a 1" union, which will fit a 1" barb, which will fit 1" braided nylon tubing with the help of a 1" ratchet clamp, though the ID/OD of none of these components actually measures 1" If you have a 1" barb with 1" braided nylon tubing connected to a 1" pipe, pump, etc then you would want the 1" ratchet clamp. We use nominal ratings for our plumbing and fittings, so if you are using standard braided vinyl tubing in 3/4", you'll want a 3/4" ratchet clamp. You will need the spigot x barb adapter to connect to 3/4" tubing. 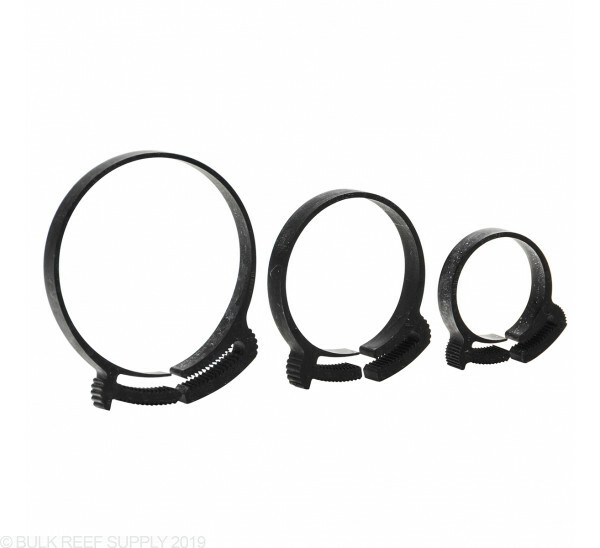 If the tubing on the reefer tank is 1' soft tubing you will need to increase the output from 3/4" on the vectra and we recommend using the Vectra adapter kit along with the larger spigot x barb adapter to do so! I have included both options below! I'm not sure what nominal size means. All I know is the braided vinyl tubing I have says that it's 1 1/4" ID and 1 3/4 OD. So which size should I get? You would want to purchase the ratchet clamp that matches the inside dimension of the tubing. We also have a conversion chart in the full details that lists out the minimum OD of the tubing the clamp will work with. If your OD is 1 3/4" and your ID is 1 1/4" then you would want to purchase the 1 1/4" ratchet clamp. I have 1/2" tubing and wanted to know what size ratchet clamp I would need for that size tubing. Thanks. All of our ratchet clamps and plumbing is listed in nominal sizes, so if you have 1/2" nominal tubing you would want the 1/2" ratchet clamp.